The DEKOR® WiFi Controller and WiFi Remote App bring home automation and "smart" control to DEKOR lighting projects: On/Off Brightness Scheduling The EZ WiFi Controller is a lighting controller that connects to your Wi-Fi network and allows you control your DEKOR lighting from your iPhone, iPad, or iPod touch. 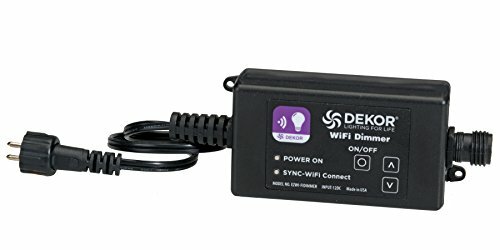 The WiFi Dimmer can be used with all DEKOR transfomers. Download and install our WiFi Remote app from the Apple app store to manage and control your lights from your iPhone or other Apple smart device. You can set-up multiple light runs or zones, providing you have a separate WiFi dimmer for each light run or zone.